Herbs such as this beautiful Chamomile are almost finished for the year. I noticed one or two flower heads still shining away in the herb garden but unfortunately, some of my Chamomile plants were burned badly by the salt wind after Storm Ali. This Calendula is more fortunate, being in the poly tunnel and may flower all winter – it has in the past. What I mean by that is that new flowers will grow as each flower head dies off and makes seed. Calendula is very good at self seeding so it seems as if it grows all the time. Just as well as now that I am a Mamo, or grandmother, I can use the flowers to make a lovely, gentle nappy cream, or bum balm for my grandson. 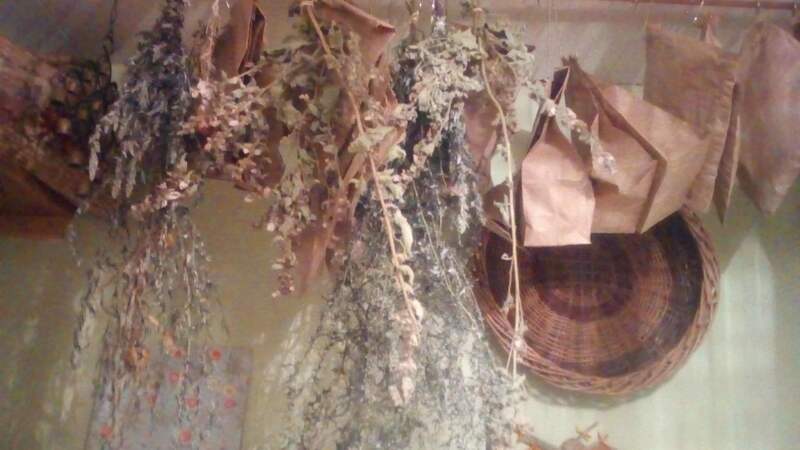 I dried lots of herbs throughout the summer and many are still in their paper bags waiting to be processed into teas, soaps, bath time products and shampoos as well as being prepared for use in the kitchen. Some are still hanging in the kitchen, (and some seeds were hung up today) and others, picked recently, are still on drying racks. I am actually feeling a little overwhelmed because of the sheer abundance of herbs I have to work with. Not really a complaint though because it is surprising how quickly they go. Once they are processed there will be more room in the house. I will be so glad when my herb shed is completed. I am enjoying calling it the HERb Shed!! Some of the herbs I grow are used in incense, smudge sticks or amulets and aid the metaphysical body, improve spiritual energy and improve sleep and dreaming. My favourite herbs for energy work are Mugwort or Artemesia and Vervain, which is one of the favourite herbs of the druids bringing five blessings with it. The five blessings are Love, Peace, Health, Wealth and Wisdom. In Ireland Vervain is used in place of White Sage which is a plant associated with the Native Americans and has been so over-exploited that it is danger of disappearing. It makes much more sense for me to use an indigenous plant that I can grow myself and that has connections back to the ancient past of Ireland. Vervain of course, can also be used in magical rites – keep it in mind with Samhain just around the corner. I have been invited to lead a Herb Walk on Sunday 14th October during the Connemara Green Festival which is held in Letterfrack. There are not many flowering herbs around at the moment but it will still be a pleasure to point out plants that are actually healing herbs, that people would have always viewed as weeds. If you should happen to be in Connemara, check out the Green Festival and come along on the herb walk – tea and biscuits afterwards! ← Danu’s Irish Herb Garden – A Radical New Beginning! Your aunt was right. Soft lovely heels – imagine a baby’s bum! Also soft and lovely and no nappy rash! That is do-able. Speak to Colette about the date and see if she is available and I could drive up for a chin wag and cup of tea. Lovely post as always Terri, filled with info and beauty! A gathering at Bealtaine Cottage? Three is always a good number…why not? Congratulations on becoming a mamo you’ll be great no doubt. I would like to learn a bit about herbal healing for family mostly when is your workshops on again. Thanks Valerie. Great to hear that you are interested in herbal healing. My next workshop is on 27 October, Plant Wisdom for Muscles and Joints and the one after that is 24 November Plant Wisdom for Winter Colds and ‘Flu. All the others are under Workshops and there is one every month. Hope to see you! Blessings. Lovely to find out about you through Colette. I am an aromatic medicine practitioner in rural Derbyshire UK. I am licenced to use the essential oils internally and via neat complexes topically, capsules, pessaries etc Also my precious oils are used in my work as a massage therapist… I have stayed in near clifden on two holidays and did not want to leave !! I wish that I had known about you then, I would have loved to have met you. I have signed up for your newsletters as it is nice to feel connected through the love of plants and healing. I am irish , so I always feel a very strong pull to Ireland. Hey Bernadette, I lived in England for years so I understand the strong pull. Next time you are in Clifden or near, definitely give me a shout and we can meet up for a chat. Best Wishes and blessings to you.